If you love this design please make sure you don’t miss the chance to purchase this very rare and hard to find kit. The three pretty little fairies on this stocking kit are dressed in fur lined winter finery with skirts that resemble figure skating outfits. While they are each dressed in a different colored outfit their wings are all the same blend of beautiful colors that seem to simulate the sparkling colors you would expect to see reflected in clear opalescent fibres. The fairies appear to be perched on branches of holly decorated with pine cones as they reach out to touch the snowflakes falling around them. 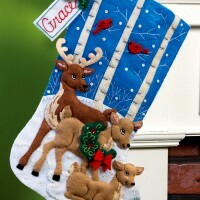 If you look closely you will see the Snowflake Charm that is included with this kit hanging near the top center of the stocking just above the L in the sample name CARLEEN. 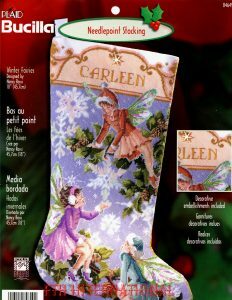 Of course you will be using the directions for personalization to change Carleen to any name you want to put on the stocking when you have finished it. Bucilla stockings are a Christmas tradition. 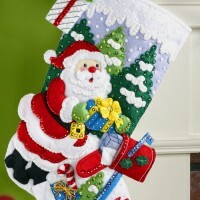 When finished, this beautiful stocking would be a great gift for anyone on your Christmas list who appreciates a work of love that they could cherish forever. This kit is in Brand New Condition having been well cared for since it was manufactured. Unlike most of the kits I have listed, this kit was not purchased direct from the manufacturer but no matter what the source or age, all of my kits are guaranteed as described or you will receive a full refund. Every kit that has not been purchased directly from the manufacturer is carefully inspected to ensure that all the contents are intact and that the quality is exactly as described in the listing. If there is ever a problem with any kit you purchase from me please contact me and it will be resolved as quickly as possible. Please check my other listings for many more current, as well as vintage and hard to find, Bucilla Felt & Needle Craft kits.